When I was 13, I was obsessed with horses and pen pals, and my most sophisticated business idea was a lemonade stand. 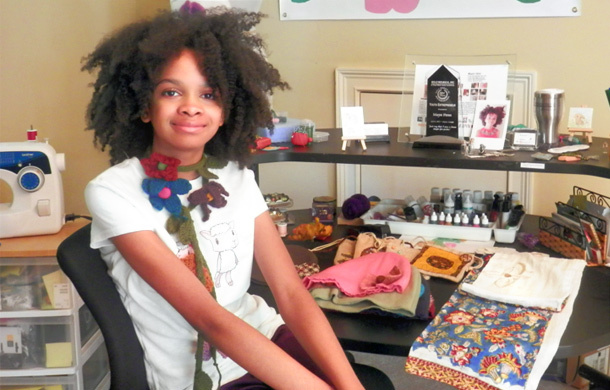 But at the young age of 13, Maya Shea Penn is already the CEO of a successful fashion and accessory company, a published book author, she has been featured in Forbes, and she has a non-profit organization called Maya's Ideas 4 The Planet. Maya's burgeoning career began at the age of 8, when she began to realize that our clothing choices have a big impact on the environment. Horrified by the toxic chemicals used to create most kids clothes, she began her own line, called Maya's Ideas. Using 100 percent organic materials, in addition to some recycled and vintage fabrics, Maya's Ideas is an inspiration to young entrepreneurs and activists the world over. She’s absolutely correct: In 2011, Greenpeace published a report called Dirty Laundry 2. In it, the organization revealed that traces of toxic chemicals — specifically nonylphenol ethoxylates (NPEs) — had been found in products made by 14 big-brand clothing manufacturers, including Adidas and H&M. Those with sensitivity to these harsh chemicals often experience negative symptoms, from rashes to difficulty breathing. The products offered by Maya’s Ideas have all of the whimsy and prettiness of designs created by a young girl in love with fashion and nature and animals. An avid drawer, Maya says that many of her designs start as simple doodles. Her collection includes lovely accent pieces, like the Asymmetrical Angles Bamboo Cotton Jersey Scarf, as well as tanks, tees, and tops, jewelry and hair accessories. She’s even branching out into wedding fashions! All are decidedly modern, with colors and patterns that fit perfectly into any wardrobe. In addition to donating up to 20 percent of the profits made by Maya’s Ideas to local and global charities, Maya recently wrote and illustrated her first book Lucy and Sammy Save the Environment, which teaches younger children the basics of recycling, pollution, and greenhouse gases. The 20-page book is initially being made available through Atlanta schools. Maya! Very impressive work! From your creativity to your eco-designs!! Make sure to not pay a dime for college, apply for those scholarships! You will get (and deserve!) every single one!! "A lot of people ask me, why eco-friendly?" Maya writes for The Kind Life. "My parents taught me at an early age about recycling, organic gardening, being environmentally aware, and being a good steward by respecting the planet and taking care of its animals. I heard about how the dyes in clothing or the process of even making the items was harmful to the people, animals, and the planet. So I started doing my OWN research and I found out believe it or not there is a wide variety of health problems for people chemically sensitive to the dyes." She's absolutely correct: In 2011, Greenpeace published a report called Dirty Laundry 2. In it, the organization revealed that traces of toxic chemicals — specifically nonylphenol ethoxylates (NPEs) — had been found in products made by 14 big-brand clothing manufacturers, including Adidas and H&M. Those with sensitivity to these harsh chemicals often experience negative symptoms, from rashes to difficulty breathing. Maya sees no reason why kids should have to wear chemical-laden clothing that pollutes our water and air, so she started making her own. "I use natural fruit and vegetable dyes and herbal teas to dye scarves and T-shirts," she explains at The Kind Life. "I use materials like organic burlap, 100% organic cotton, hemp, tencel, art silk (not really silk, but a blend of rayon and cotton), and fleece, as well as recycled and vintage materials in creating my clothing and accessories." The products offered by Maya's Ideas have all of the whimsy and prettiness of designs created by a young girl in love with fashion and nature and animals. An avid drawer, Maya says that many of her designs start as simple doodles. The collection includes lovely accent pieces, like the Asymmetrical Angles Bamboo Cotton Jersey Scarf, as well as tanks, tees, and tops, jewelry and hair accessories. She's even branching out into wedding fashions! All are decidedly modern, with colors and patterns that fit perfectly into any wardrobe. "I feel that I can meet the needs of my customers without compromising the ability of the future generations to live in a greener tomorrow," Maya wrote. "I believe that everyone should do their part in coming up with new and innovative ways to make positive changes affecting our environment and it's creatures efficiently, and sufficiently." In addition to donating up to 20 percent of the profits made by Maya's Ideas to local and global charities, Maya recently wrote and illustrated her first book Lucy and Sammy Save the Environment, which teaches younger children the basics of recycling, pollution, and greenhouse gases. The 20-page book is initially being made available through Atlanta schools.